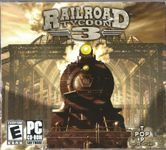 Railroad Tycoon 3 is a computer game in the Railroad Tycoon series, released in 2003. The game interface is in full 3D, with free camera movement. The square grid is no longer rigid, as it was in Railroad Tycoon and Railroad Tycoon 2 - rail and structures can now be rotated 360 degrees.The track building function is not very realistic, as tracks are sometimes built at angles almost at 90 degrees to each other. The Railroad Tycoon series is a strategy game centered on the railroad industry. The strategy varies depending on the map or scenario, but the main idea is to build a railroad empire and overcome specific goals, whether it be hauling a certain amount of freight, connecting to specific cities, achieving specified financial goals for the company or chairman, taking over other railroads, or whatever else the scenario requirements may be. Playing the stock market is also an integral part of the game.